President Tsai Ing-wen said April 10 that Taiwan’s economy is on the growth track and there are many potential-laden areas for Taiwan and like-minded partners such as the U.S to cultivate mutually beneficial opportunities. Taiwan’s gross domestic product growth will top 2 percent this year, Tsai said. Salaries are rising, more than 76,000 jobs were added over the past 12 months and unemployment is at a record low, she added. Over the past three years, many jobs have been created in Taiwan by Amazon.com Inc., Facebook Inc., Google, Microsoft Corp. and Micron Technology Inc., Tsai said, adding that this is due to the tech giants recognizing the country’s potential and quality of local talent. 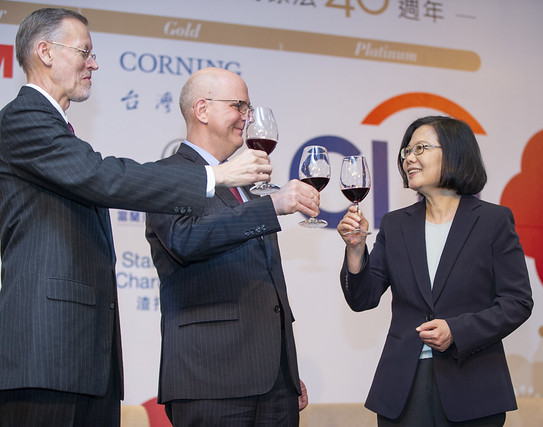 Tsai made the remarks while addressing the American Chamber of Commerce in Taipei’s annual business banquet. A-list attendees include Foreign Minister Jaushieh Joseph Wu; David Meale, deputy assistant secretary for trade policy and negotiations at the U.S. Department of State’s Bureau of Economic and Business Affairs; Brent Christensen, director of the American Institute in Taiwan; and new AmCham Director Leo Seewald. According to Tsai, the government is making real headway on resolving issues raised in AmCham’s latest Taiwan White Paper. Participating companies indicate they are very satisfied with the investment climate and are expected to make more investments going forward, she said. The latest information from the Cabinet-level National Development Council reveals that a record 38.55 percent of the 83 issues raised in the white paper are resolved or nearing resolution, with the remainder prioritized for attention. Progress is also advanced on key areas like innovation, stable power supply and reform of regulations governing investment by foreign private equity funds. There is no doubt the government is on the right path, building momentum and showing results, Tsai said. This benefits the private sector and most importantly, the 23 million people of Taiwan, she added. Tsai said the government is rock solid in its commitment to safeguarding Taiwan’s security. This is to be achieved by making the economy more diverse and resilient, she added, warning of new, sophisticated threats coming from the other side of the strait. Central to this approach, Tsai said, is strengthening Taiwan-U.S. economic relations. There is great value in pursuing a bilateral trade agreement and creating a model for the Indo-Pacific, she added. The government will also upgrade Taiwan’s ability to respond to traditional and nontraditional security threats, Tsai said, adding that this will spur the pace of reform, bolster economic fundamentals and boost the competitiveness of homegrown firms.